IHeart Organizing: Reader Space: Gettin' Peggy With It! 26 Reader Space: Gettin' Peggy With It! Pegboard systems have been an organizing dream tool for ages now, but for me, they never get old. In fact, this girl has two different ones in the works that I am really excited about! 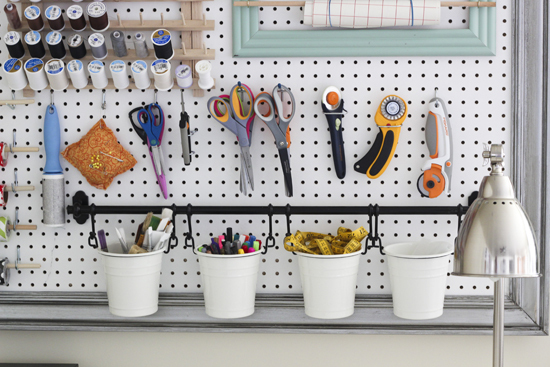 Did you know that you can achieve instant bliss by looking at an organized pegboard? 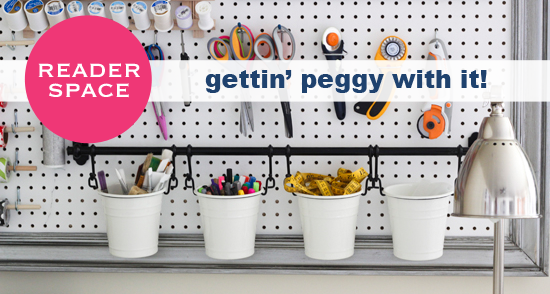 Well, get ready to get peggy with it, because today's reader space shows how a pegboard can rock as easy to access vertical craft storage. I am excited to introduce you to Heidi of Honeybear Lane! She created the most beautiful pegboard system that I have ever seen. And I couldn't wait to invite her over to spread the awesomeness with you! Here she is now! What is the main function of this space? "It is a crafting area, and I have TONS of crafting supplies. I was really sick of everything being all over the place and I had this huge blank wall. Obviously, an enormous pegboard was the only solution." 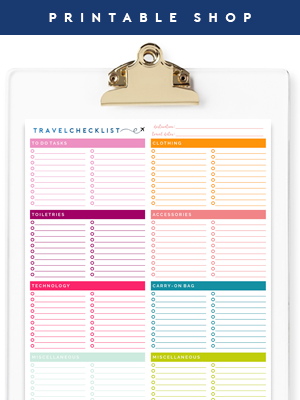 "Since I spent a long time laying out the initial organization, the upkeep is extremely minimal. Just put stuff back where you got it, and since it is right there, it is all so easy to find." What items did you find were essential when organizing this space, and why? "I had to have a giant thread organizer because I was keeping my thread in an obnoxious box that constantly got messed up and tangled. I also wanted all my scissors and rotary cutters to have their own hook. The greatest thing that holds everything up is a simple pegboard hardware kit that you can buy at Home Depot, I actually ended up using two sets. I also incorporated the IKEA kitchen buckets which hold my paintbrushes and markers." What did you do to "Make it Pretty"? "I started with the thread holder and I have a lot of thread - but I actually bought a lot more in every color so it could be all color coded and pretty. Then I decided to display my paint and glitter collections since they were also rainbow colored. This ended up being perfect because now they are out where I can easily find them, know what colors I have, and their beautiful colors really pop on the white board! I also used a large thrifted frame that I sprayed aqua to hold my vinyl." "I added the giant frame around the whole thing which makes it feel more like a work of art rather than a utilitarian pegboard - and it was super easy! I also added some C-shaped screws to the thrifted frame and cut dowels to size to hold the vinyl. We used two cleats to hang the entire thing on the wall." How has this project impacted your life for the better? "My craft area still gets messy frequently because I still need more organization in other areas, but it is so nice that there are certain things that always stay organized and in good condition. 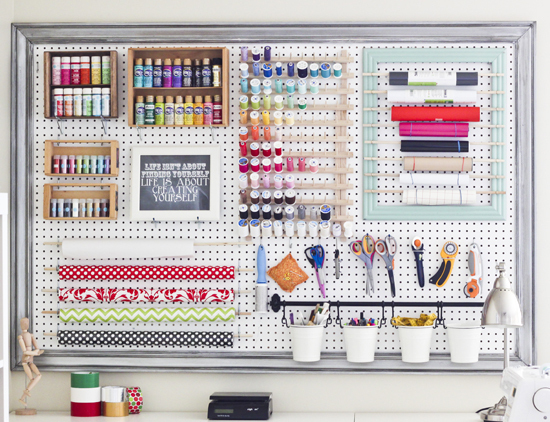 I wish I could use pegboards everywhere!" 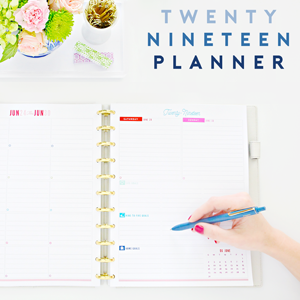 So functional, so simple, so gorgeous! Take a moment to check out all of the supplies this single board holds: craft paints, glitter, spools of threads, vinyl rolls, gift wrap, cutting tools, paint brushes, pens and other miscellaneous supplies. I can only imagine the amount of desk space and storage boxes that have been saved by this little project. And the fact that everything is out in the open, easy to access and simple to put away, sets her right up for success! I have learned first hand that the more steps you have to take to put something back, the less likely it is to happen. That is what makes this system such a huge win! Oh, and I would totally organize everything in rainbow order as well. That is just one more thing this color lovin' gal adores about this sweet little system! 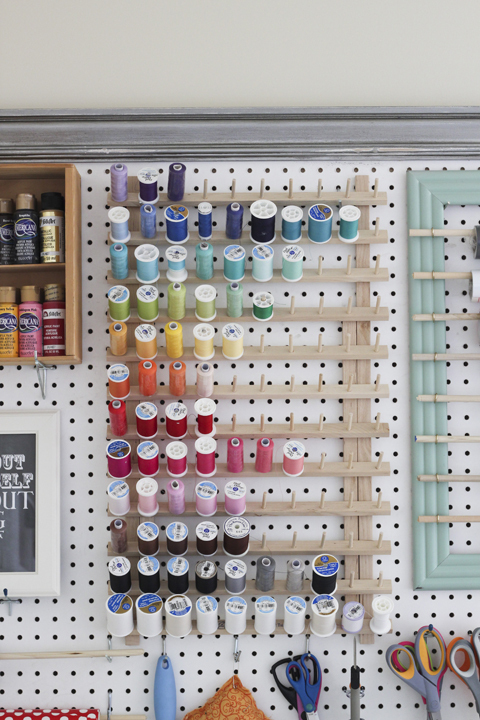 A huge thank you to Heidi for letting me share her oh-so-organized pegboard project! You can check out more photos and all of the details on her blog here, and a DIY tutorial of how she built the pegboard frame here. Who else is gettin' jiggy with pegboard? Tools? Craft supplies? 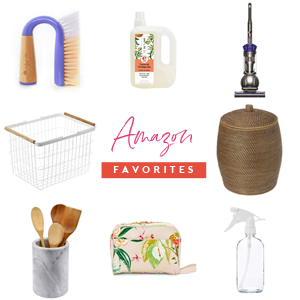 Cleaning supplies? What is your favorite way to use this super versatile organizing solution? What fantastic ideas! I love the frame/vinyl holder. I also love the IKEA finds that are in your home and Heidi's pegboard system. I've always wanted the kitchen buckets but they won't work in my kitchen so NOW I know where to use them!! Love this - need to do this with my art supplies! I absolutely LOVE this! The pictures are so inspiring! Thanks for sharing! Thank you for sharing this inspiring post. I visited her site and found some other great ideas and information. Count me as new follower! 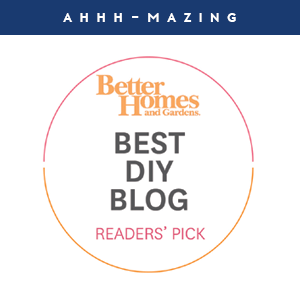 I adore your blog!! I don't move into my new place until May, but you are my go to for all ideas! I just love peg boards! 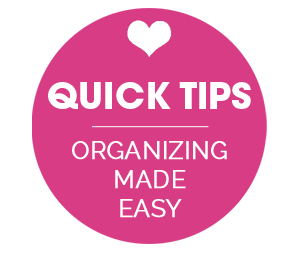 Thank you so much for blogging about this wonderful way to organize! I love that you put the bottles of paint on the peg board. 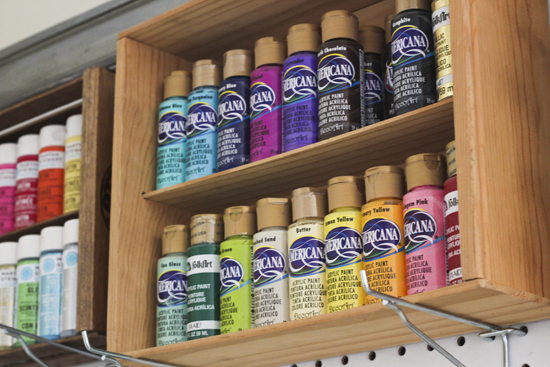 Where did you find the wooden boxes to hold the bottles of paint? SOO CUTE!! Oooh I have a great big peg board sitting in my basement right now just waiting for some love! Pinning this for inspiration! Thanks for sharing, ladies! I'm always looking for ways to use something in a way it's never been used before. My husband uses pegboard at work, in the garage, in the basement...why had I never thought of using it in the house for myself?! Brilliant! This is a perfect idea, especially because my little one is now getting into everything and my paint and scrapbook supplies are no longer safe in their baskets at floor level. Thank you for this idea! On my way lovebug! ;) You + Organizing = My idea of a good time!! :) Thanks! I was referring to myself! I am 38 years old and I refer to my girlfriends as girls all the time. I think that is common language this day and age to say - Hey Girl! - to a friend. No worries! This makes my heart go pitter-patter. I love looking at a nice clean organized space, ESPECIALLY for crafting! I'd love to do this for myself. This was one of my inspiration photos for my own pegboard, which I just installed last weekend. I even built my own three-tier boxes to organize my acrylic paint using poplar boards. I don't have it 100% organized yet but so far I love it!! Sounds awesome and I bet it feels great! This pegboard is inspirational for sure, one of my favs yet! That is so well put together and so colorful-- love it! That is awesome! I really wish I kept things this organized, I never know where anything is in my craft space!